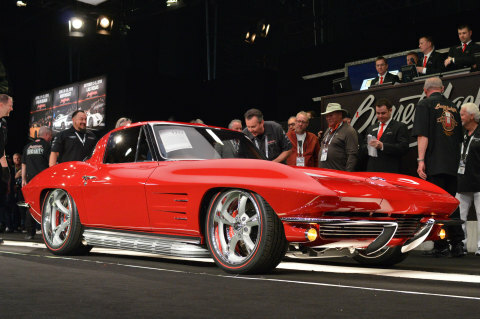 SCOTTSDALE, Ariz. February 4, 2019 Barrett-Jackson; Not only did total auction sales soar to $131.6 million, but the weeklong event solidified significant market trends, as well as dynamic shifts in the hobby, which have been predicted by Barrett-Jackson Chairman and CEO Craig Jackson and President Steve Davis since the early 2000s. Based on internal sales and market data over the last decade, among the trends Barrett-Jackson identified was the growing demand for professionally built Resto-Mods as well as an increasing number of Gen X and millennial buyers coming to the hobby. While prewar classics were hot at the time, we recognized the demographic of our buyers would change over time and consequently the demand for those cars would also change. Plenty of naysayers thought it was foolish when we began adding 1960s and 1970s muscle cars to our docket. But we realized these were the dream cars of baby boomers and they had the means to buy them. Itâ€™s rewarding to look back and know, without a doubt, that we were right. Even today, they remain one of our most popular docket vehicles, and have increased in value significantly over time.â€??? Resto-Mods is one of those trends we saw emerging from the customs segment nearly 15 years ago. We had the foresight to give these cars the platform to be seen by millions of collectors, which has made Resto-Mods one of the fastest-growing segments in this hobby.â€??? Similar to the upward trend of classic muscle cars, Resto-Mods have also experienced a jolt in demand among buyers. Over the past two years alone, Barrett-Jackson has seen a steady increase in not only the amount of customs and Resto-Mods sold, but also an increase in value. At the 2019 Scottsdale Auction, 161 custom vehicles were on the docket, an increase of 87.2 percent over the 2017 Scottsdale event, while the average sale price for vehicles in that category has risen 27.7 percent, from $62,711 to $80,103. Established in 1971 and headquartered in Scottsdale, Arizona, Barrett-Jackson, The Worldâ€™s Greatest Collector Car AuctionsÂ®, is the leader in collector car and automotive lifestyle events, which include authentic automobilia auctions and the sale of high-profile estates and private collections. The company produces auctions in Scottsdale, Arizona; Palm Beach, Florida; at Mohegan Sun in Connecticut; and Las Vegas, Nevada. With broadcast partners MotorTrend (formerly Velocity) and the Discovery networks, Barrett-Jackson features extensive Â live television coverage including broadcasts in over 150 countries internationally. Barrett-Jackson also endorses a one-of-a-kind collector car insurance for collector vehicles and other valued belongings. For more information about Barrett-Jackson, visit Barrett-Jackson.com call 480-421-6694.